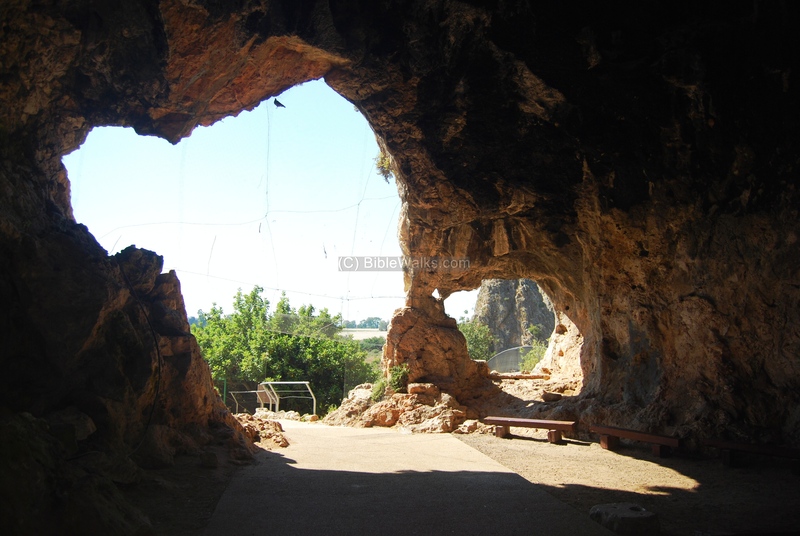 The large set of caves is located at the western slopes of Mount Carmel, in Nahal Maarot. A UNESCO World heritage site. Mount Carmel and the shore of Carmel have more than 210 prehistoric known sites, spanning from 150,000 years ago. One of the major caves are in Nahal Maarot - known as the Carmel Caves. Another set of caves is in Oren valley and is covered in an additional web page. 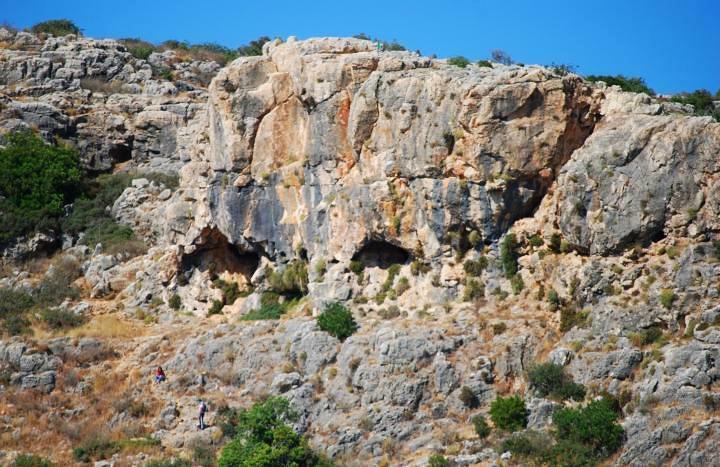 These caves were the main dwelling sites of the early man, while the other sites were either seasonal (like in Oren) or workshops. 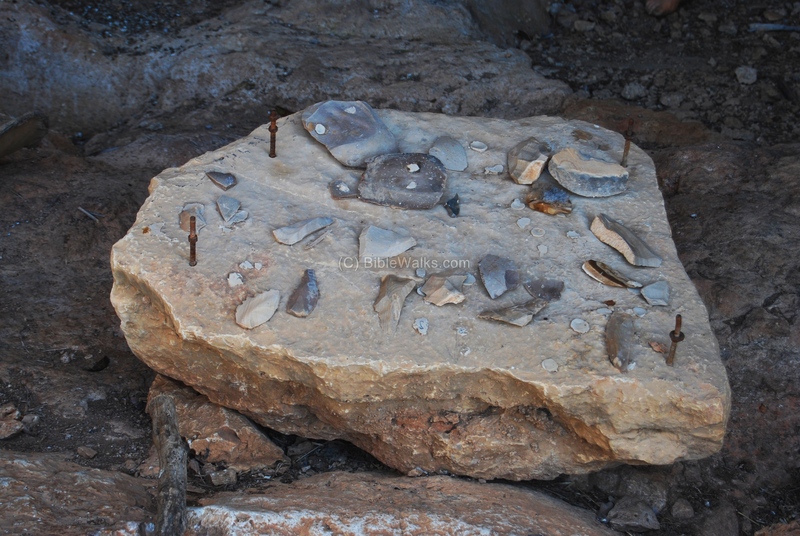 Here the archeologists revealed rich findings, which are famous in the prehistoric research. The four caves were listed as UNESCO World heritage sites on June 2012. 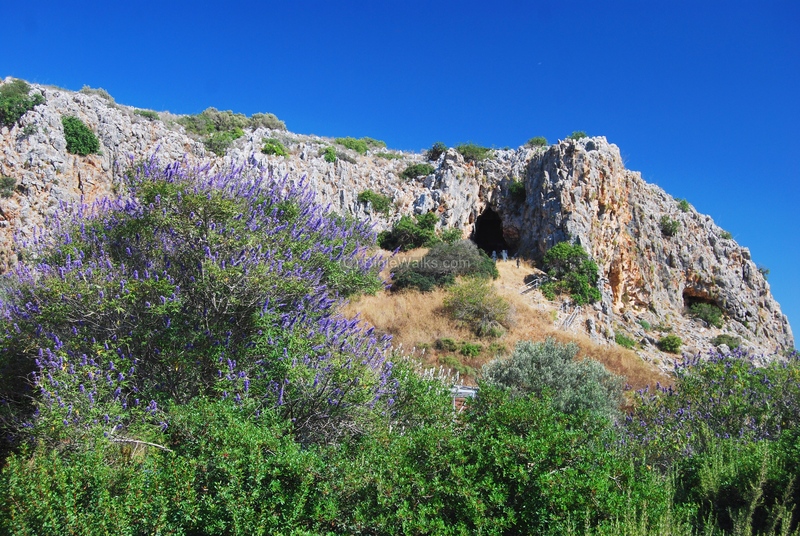 These caves are located 4 KM south of Ein Hod (near Atlit), on the old Haifa-Tel-Aviv road (#4), on the western edge of Mount Carmel. You can point on the purple points to navigate to the selected point. 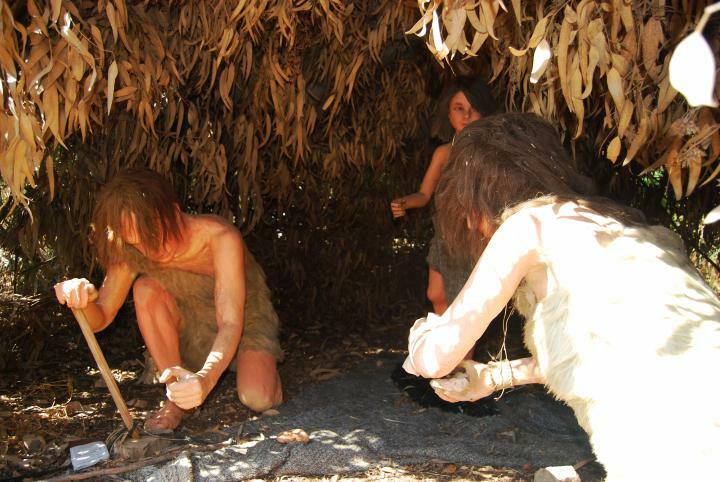 Based on the majority of excavations in the Carmel region, most scientists believe early man has been in this area over the last 150,000 years. 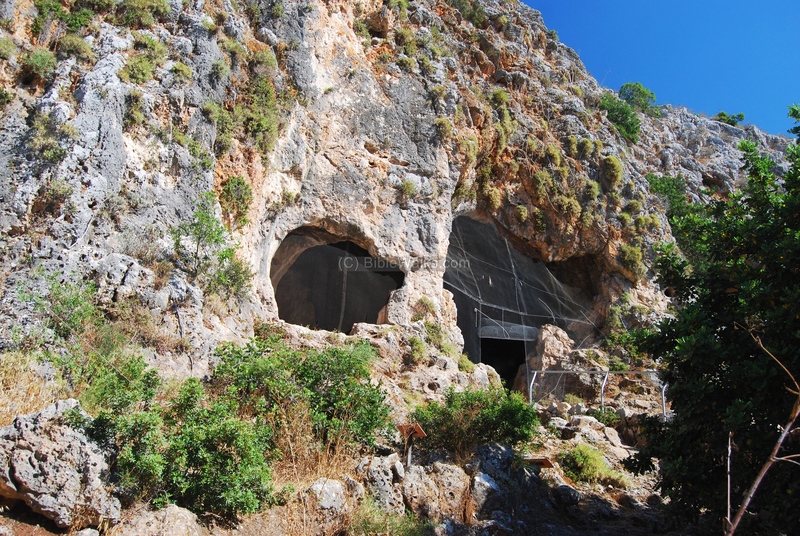 Only a few sites, such as the caves in this site, were populated during earlier periods (Lower and middle Paleolithic period, starting from 250,000 years BC). The number of sites per period fluctuated during these years. The population peaked during the Middle Paleolithic period (80,000-40,000 BC), the Epi-Paleolithic period (16,000 - 8,300 BC) and the Neolithic period (8,300 -4,500 BC). There were fewer numbers in the Early Paleolithic period (150,000-80,000BC) and the upper Paleolithic period (40,000 - 16,000 BC). In the Middle Paleolithic period (80,000-40,000 BC) there were the majority of the settlements in the Carmel. These people knew how to make knives, scrapers and points out of flint. The popular areas of the Carmel were the sites of the source of the flint stones, and there were many workshops that prepared theses tools. There were two types found in the Carmel: Homo Sapiens (our ancestors) and the Neanderthaloids (Neanderthal, the specie that eventually disappeared about 30,000 years ago). Note that this time coincided with the last Ice age (100,000 to 10,000 BC), and so the climate was wet and cold, and many Oak trees were growing in the Carmel. In the later periods, the Epi-Paleolithic period (16,000 - 8,300 BC) and the Neolithic period (8,300 -4,500 BC) the early man already domesticated plants and animals. The type of early man that was found from this period was the archaic Mediterranean type, with average height of 160-165 cm. flint workshop sites (most of the sites in the top of Mount Carmel). 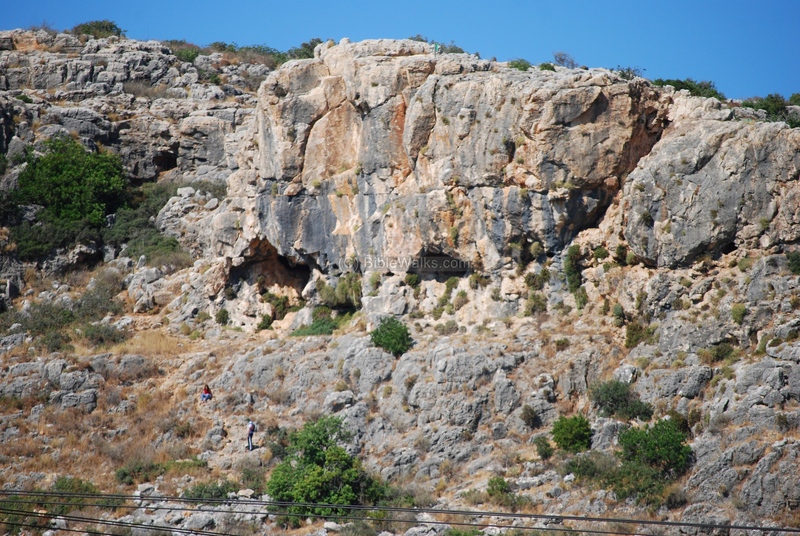 These caves are one of the oldest in Mount Carmel, starting from 500,000 years ago. The park is located near the old coastal road (#4) and is easily accessible. A nature reserve park maintains the site. This aerial view shows the site from the west. The visitors center occupies the white round structures, with a parking lot on its south side. 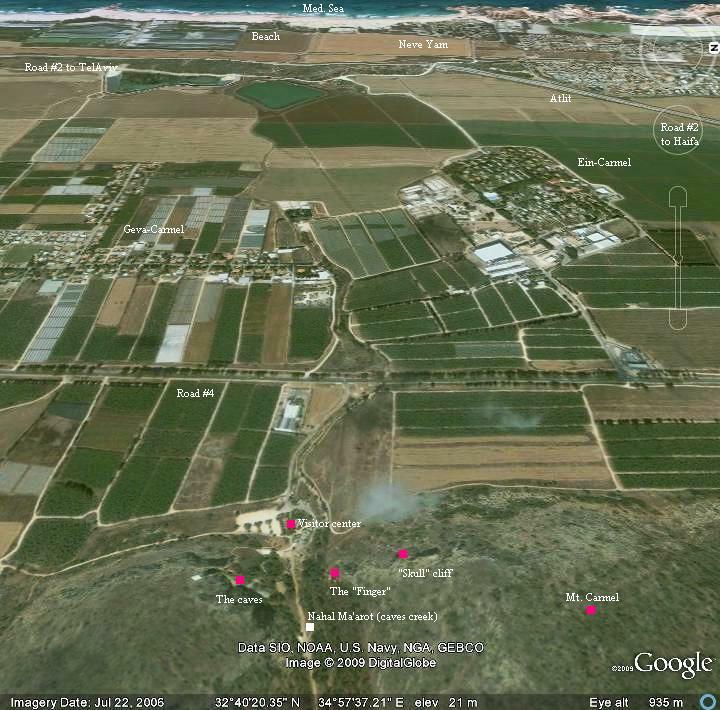 Behind it, in the center, is Nahal Ma'arot (the caves creek). On the right (south) side is the cliff where the four prehistoric caves are located. A cliff called "the finger", seen on the right side below, is located across the valley, and is made from a fossilized reef. 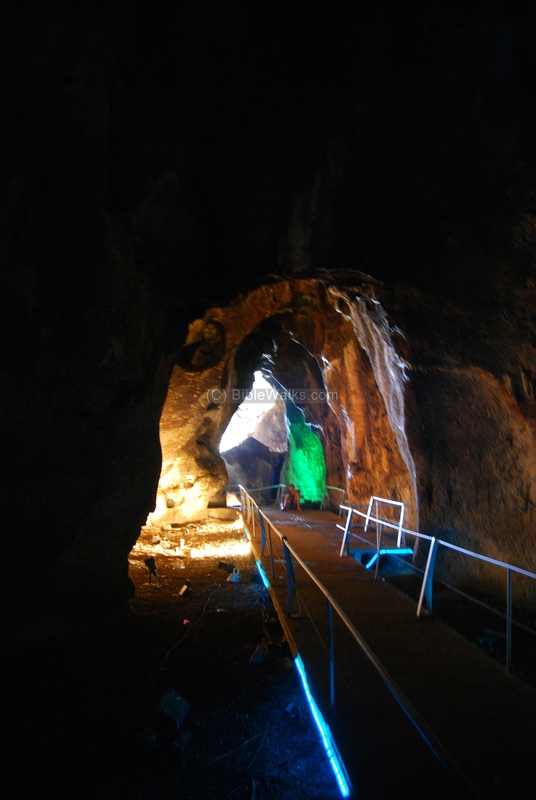 The Tanur (Tabun) cave is the highest of the caves, and located on the south side. The following photo shows the entrance to this cave, close to the top of the cliff. 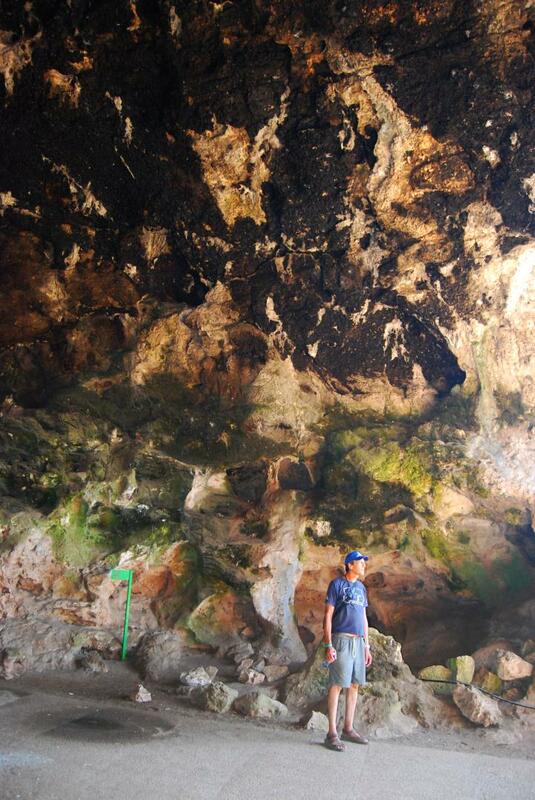 In this large natural cave, the early man used as a shelter, campfire and housing. The stairs lead from the visitors center into the entrance of the cave, located on the left side of the cliff. 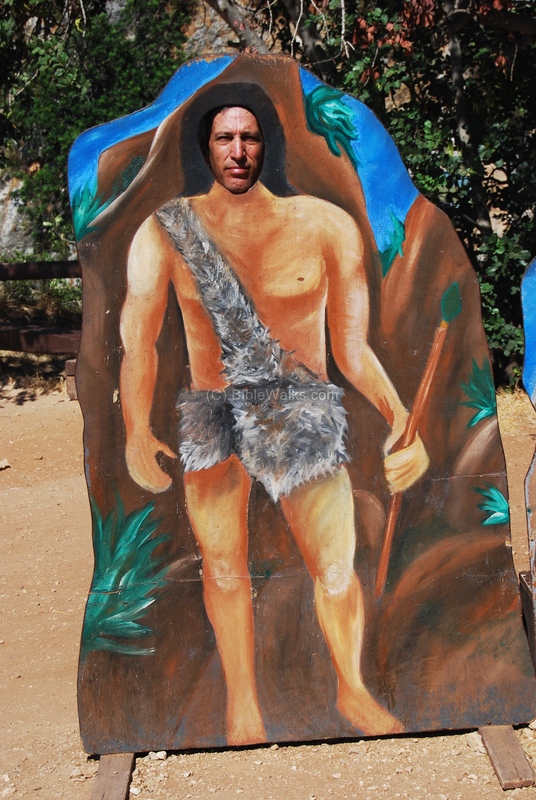 Just before the cave, the "cave men" greet the visitors. The cave has no roof, and is open to the west side. It resembles a chimney, and was therefore called "Tanur" (Tabun in Arabic). 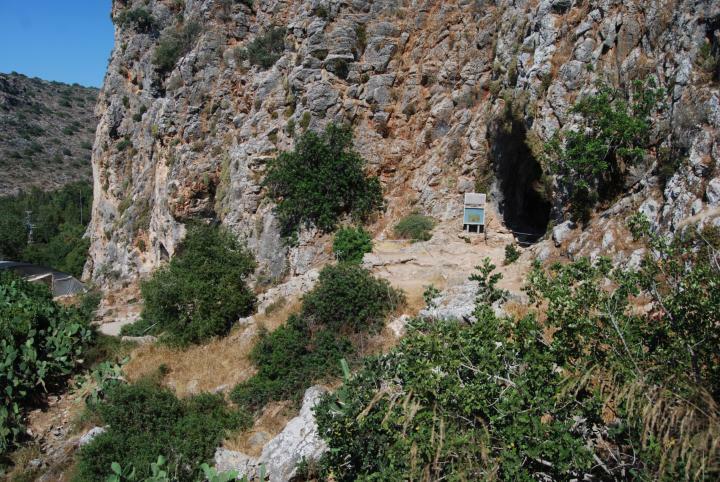 This cave has one of the longest sequences of human occupation in the Levant. Along the 20M (!) height of the deposits in this cave are traces and tools of various periods of three civilizations, starting from 250,000 years ago ("Acheulean" - layer F-G) at the lowest level closest to the bedrock, through the intermediate period ("Yabrudian", layer E) and up to the highest level which is the youngest - 40,000 years ago ("Mousterian", layer B-C-D). After then the cave men moved to the nearby Nahal cave. The chart below, displayed near the cave, shows the structure of this cave and relationship to the different periods. 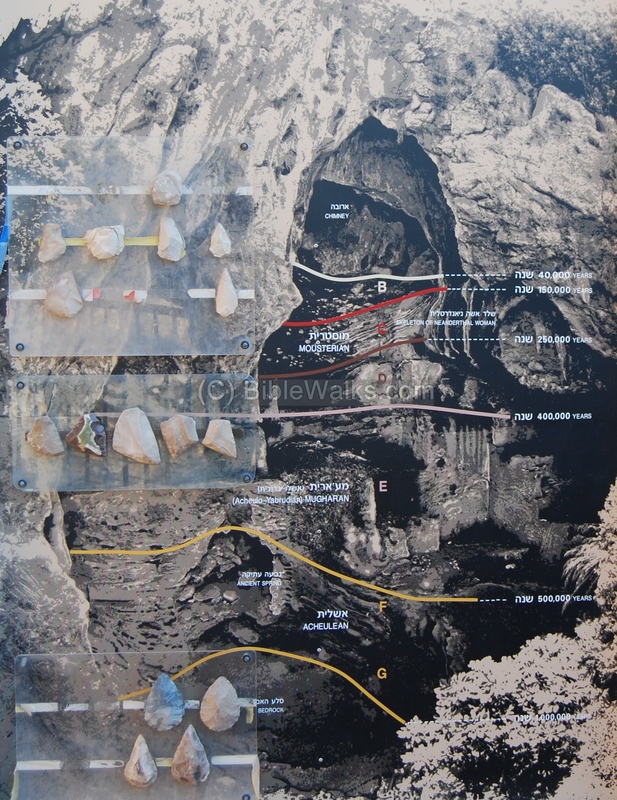 Along the vertical shaft of the cave are the markers used by the archaeologists, and signs describing the various levels. 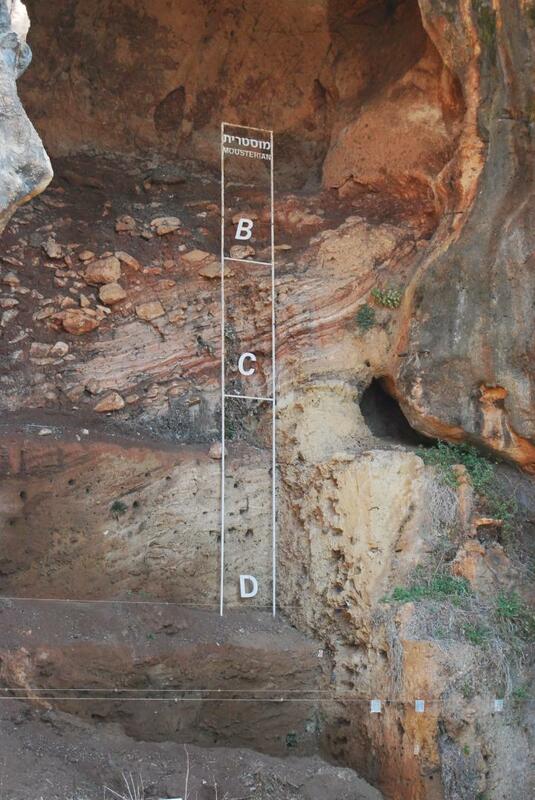 The photo below shows a detail of the Mousterian level (70,000 - 40,000 BC, also known as the Middle Paleolithic period). 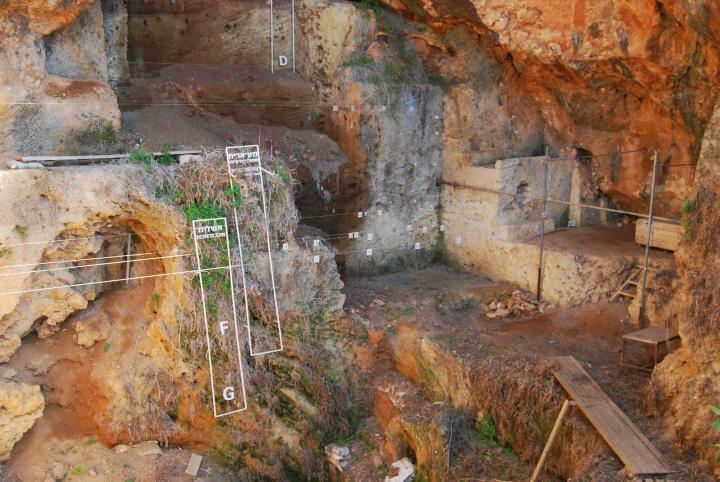 On level "C" the excavators found a skeleton of a Neanderthal woman. The Neanderthals differ from "us" (the Homo-Sapiens) by their looks (a short and very powerful build, receding chin and forehead, and large nose). They were skilled hunters and craftsman. The Neanderthals diverged from the Homo Sapiens at roughly 200,000 years ago. They became extinct 30,000 years ago from unknown reasons- either due to inability to adapt to the changing climate, clash with the Homo-Sapiens ("Did Humans kill Neanderthals? ", Time 7/24/09) , virus that affected only them, inefficient metabolism (they required twice more calories, mostly meat), or other reasons. This is a real mystery: Why did this 200,000 year old specie disappear? It is interesting to note that the soil in the ancient layers of the cave is composed of sand. 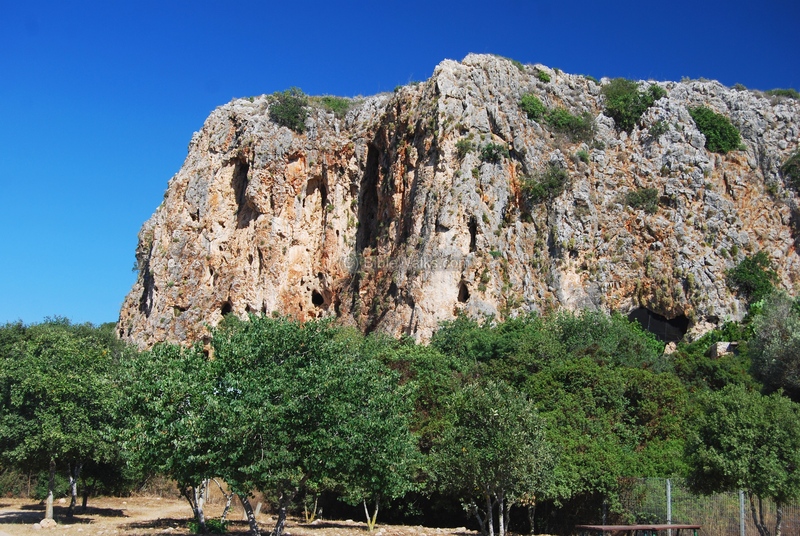 Its presence indicates that the beach line reached to the entrance of the cave at ancient times , while today it is 3.5KM to the west. This was a result of global warming in those years (250,000-150,000 years ago), when the sea level increased significantly following the melting of the icebergs. It seems that this cycle may be repeating... The common theory of global warming, which holds that the temperature change is a result of mankind's abuse of the environment, may be wrong, and the process is actually related to natural factors. 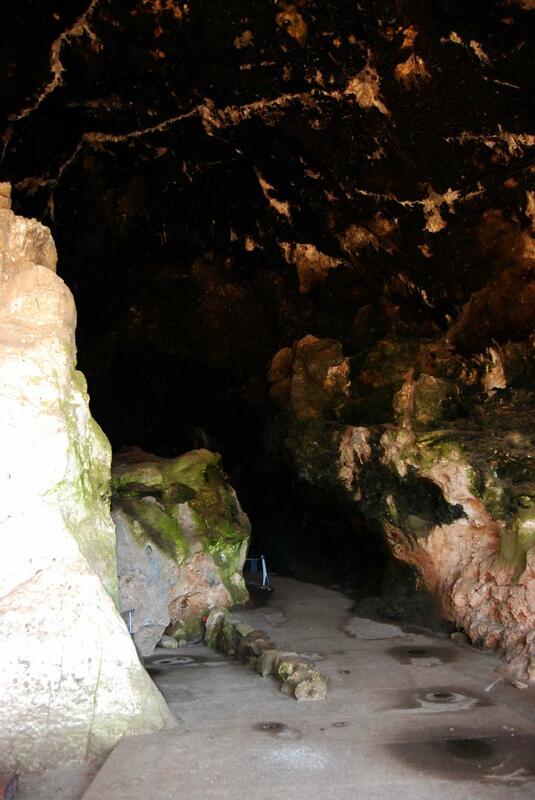 The Gamal (el-Jamal) cave is located on a lower height to the north. The entrance is seen below, accessed by a path from the Tanur cave. The cave is widely open to the west and is bell shaped. 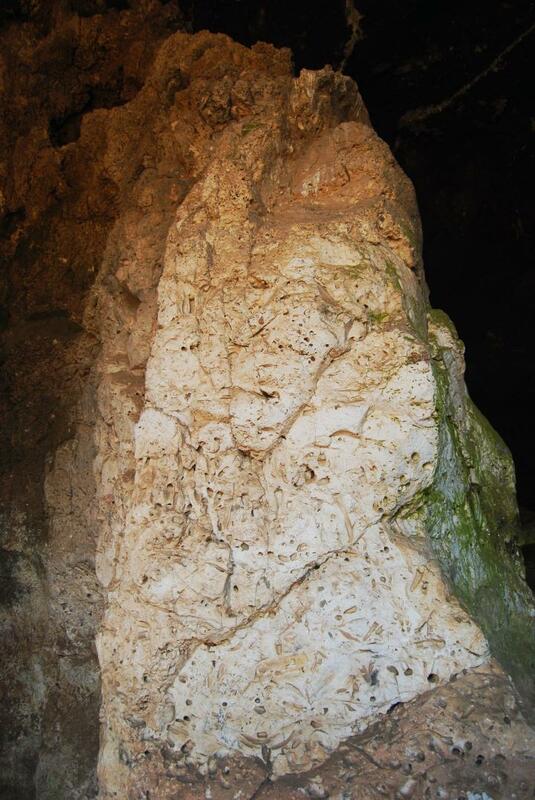 These "Carstic" caves are formed by the rain which dissolved the limestone. 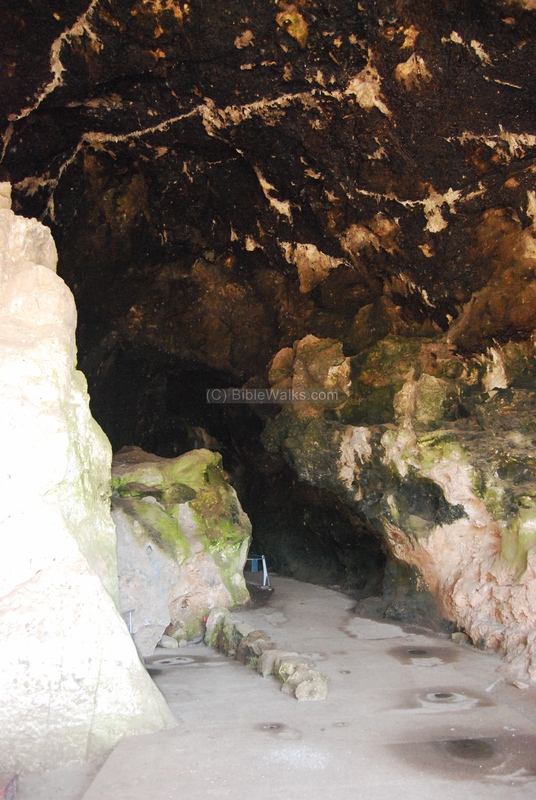 The Gamal cave hosts a gallery of findings of the Mousterian civilization (70,000 - 40,000 BC). The interior of the cave is seen below, with examples of "cavemen" - manikins dressed with "out fashioned" clothes - and a the tools they used. 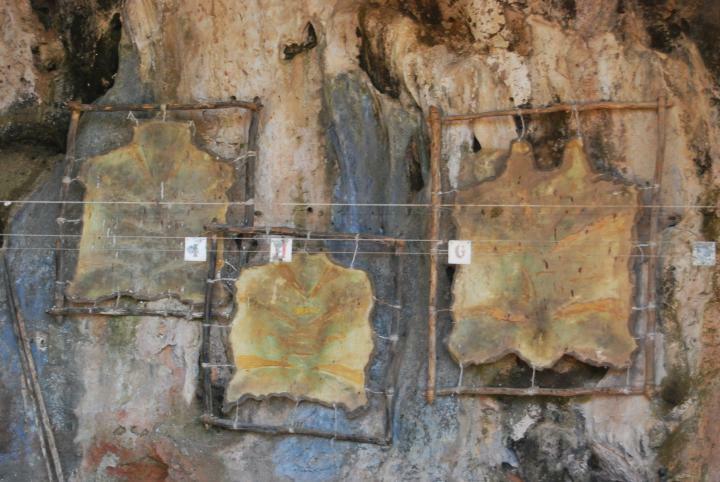 The photo below shows a display of the skins of the animals they hunted, which are dried stretched over wooden frames. A sample of their flint stone tools is seen below. Another detail of the cave woman is seen below. A skeleton of a Neanderthal woman was found in the Tanur cave in level "C", dated to 120,000 years ago - one of the most ancient skeletons found in Israel. 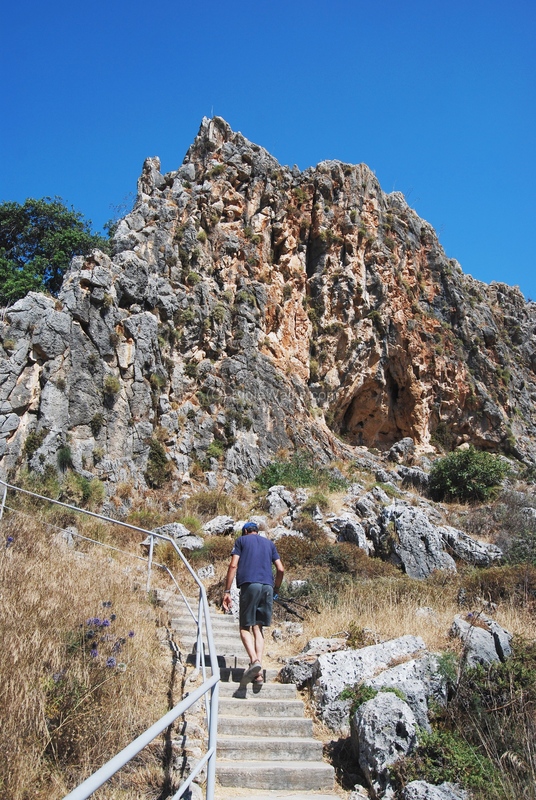 The third cave - Nahal (brook) - is located on a lower-north level. It is the longest cave (70M), and has a "door" on the right and a "window" on the left. Before the 1930s the right side of the "door" was split by a vertical rock, and the cave looked like a skull with two "eyes" (windows) on the sides. The entrances are covered by a screen in order to prevent the birds and bats to get into the caves at night time. A "terrace" is located in front of the cave. Period 1: Part of the Upper Paleolithic - from 40,000 years to 20,000 years ago. Period 2: For 8,000 years there was a missing gap. Period 3: The Natufian culture - 12,000 to 10,000 years ago - which focused on the front of the cave and on its terrace. The oldest layer in this cave was the latest layer in the Tanur/Tabun cave, about 40,000 years ago, so there was a continuity of settlements between the two caves. The entrance hall is quite high, as seen below (compared to Uncle Amnon which is almost 2M high). This front hall was the major location of the early man dwelling, since it was bright and ventilated. It was also where the Early man buried their dead: 87 skeletons were found here. This practice of burying the dead inside the dwelling area continued up to the middle stone age (Epi-Paleolithic period, 16,000 - 8,300 BC). From the entrance of the cave a narrow path leads into the rear of the cave, a total length of 70M. It is pitch dark inside, but fortunately the cave is illuminated with a colorful light & sound show. After the entrance is a large fossilized reef, which preceded the early man - created 100 Million years ago over a period of 1Million years. This rock formation is 150M thick. It was once under the sea, and was pushed up in the geological past. 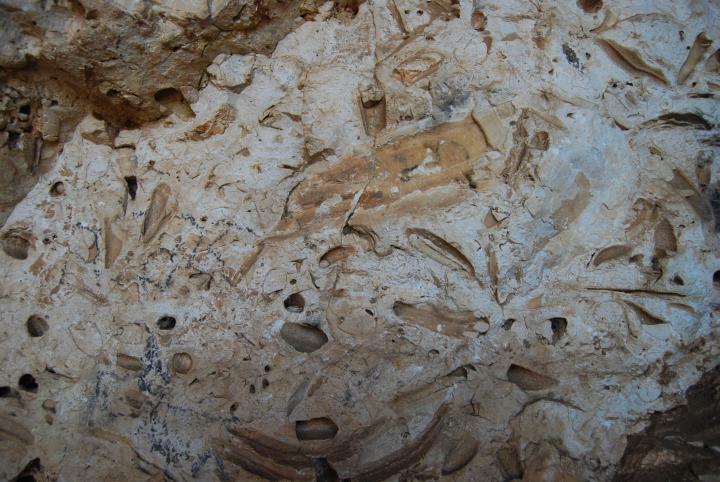 A detail of the fossils in the reef is seen below. The fossilized conical shells ("rudists") are typical of the upper level of the reef. Another view of the path that leads into the deep side of the cave is seen below. 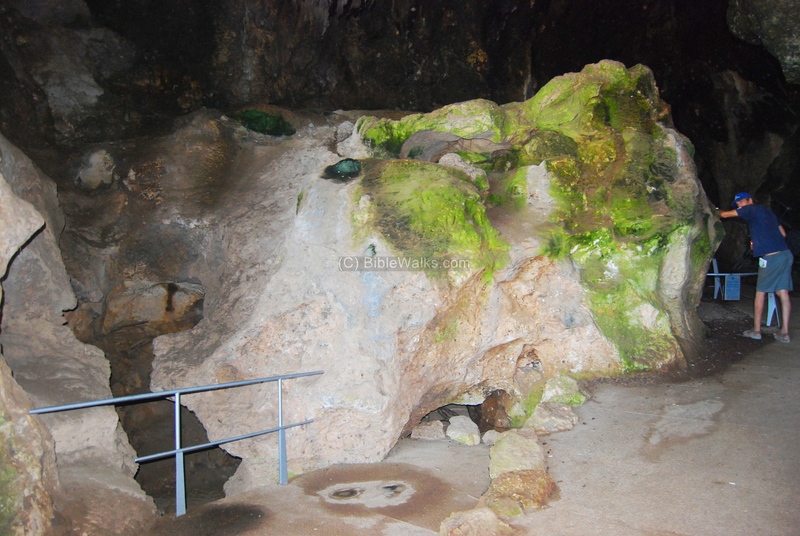 The internal section of the cave was not in use during the prehistoric periods. A multimedia show is played in the rear side of the cave. Along the walls is a light show that is synced with the sounds. At the edge of the cave is a large screen that shows scenes from the daily life of the cavemen. 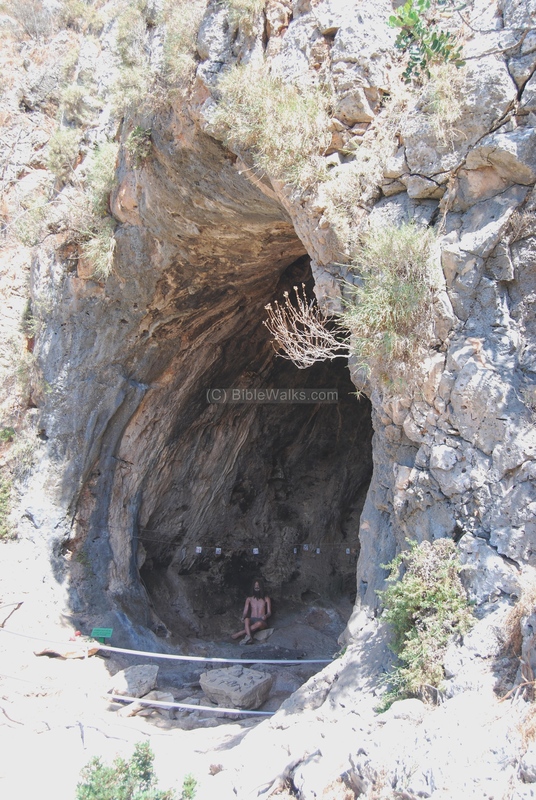 The photo below shows another view of the cave, but looking towards the shining entrances. Below is an animation of the various lights displayed during the show. 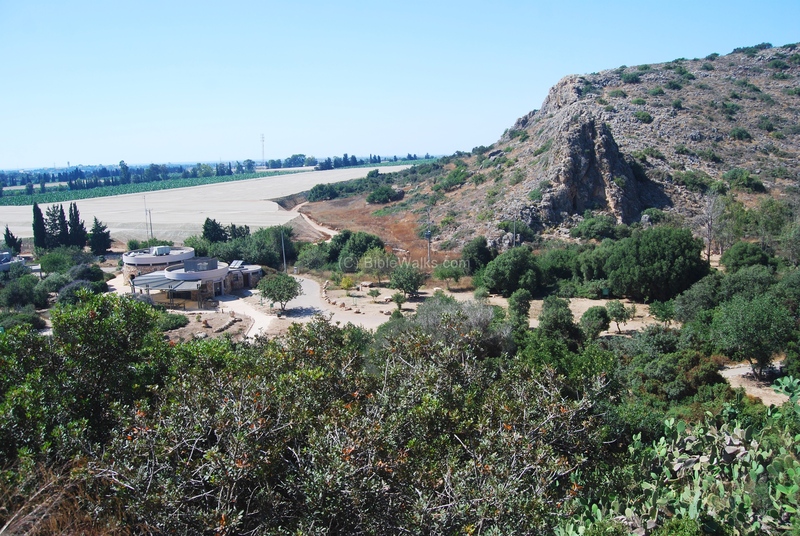 On the north-east side of the cliff is the Hagedi (es-Skhul) cave, which is not open to the public. 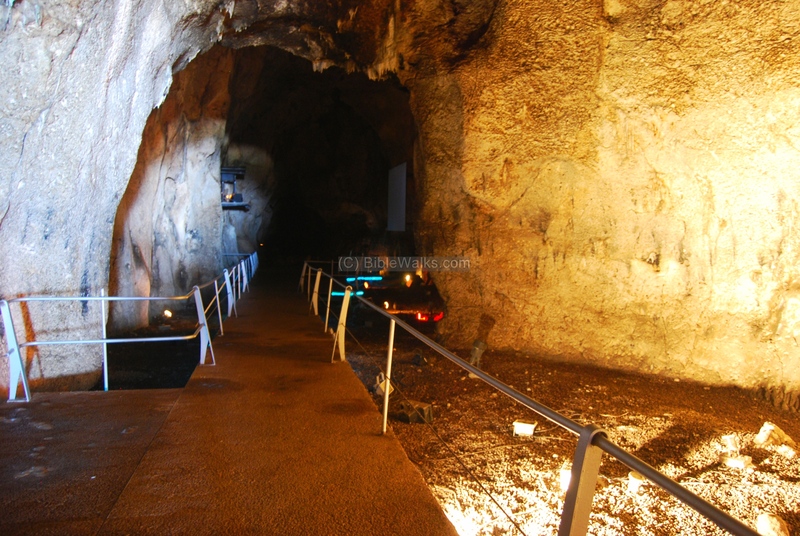 This cave served as residence for the Homo-Sapiens (our ancestors) , who coexisted (a remarkable finding) with the Neanderthals who resided in the Tanur cave during the Mousterian period (150,000-40,000BC). This coexistence without interbreeding continued for 40,000 years, as found in other sites and according to recent DNA gene studies. Fourteen skeletons were found in this cave. 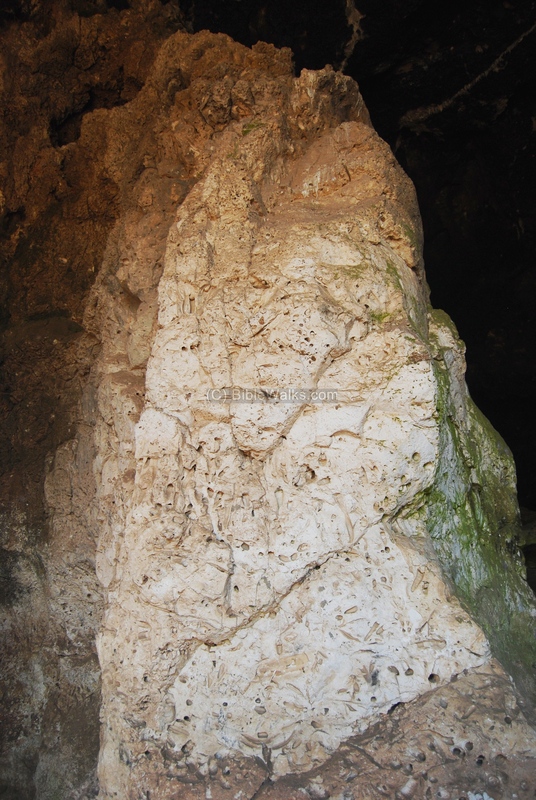 Near the entrance of the Nahal cave are rock-cut basins from the Natufian culture period (12,500-9,500BC). They were probably part of the ritual ceremonies in the cemetery that was located at this site. 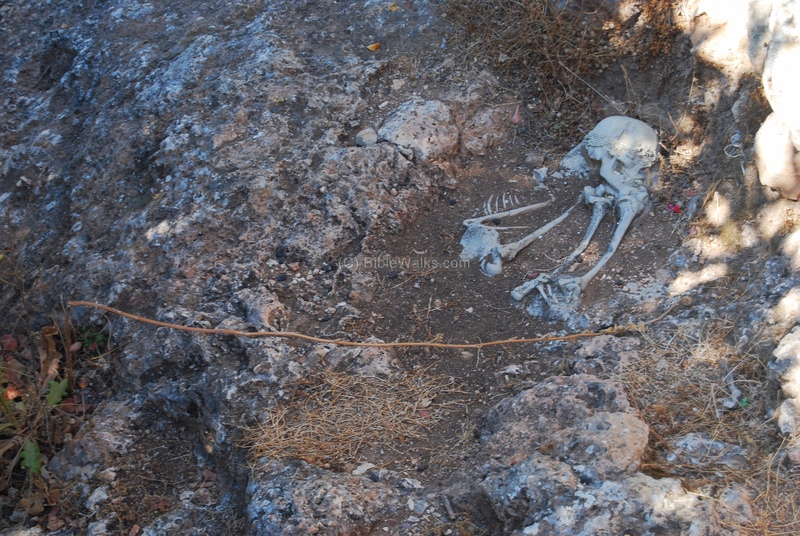 A copy of a decorated skeleton, belonging to the Natufian burial site, is located at this site on the terrace on front of the Nahal cave. The skull is decorated by small bones - a common Natufian burial practice. A wall was built as part of the cemetery, an important phase of human construction. 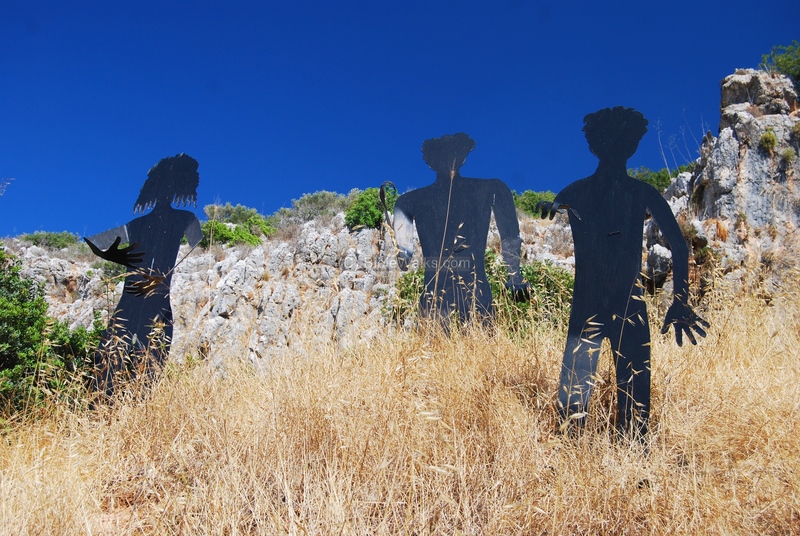 During the period of the Natufian culture (12,000-9,500 years ago) these hunter-gatherers built a village on the area in front of the cave. A display of a group of cavemen is seen in front of the Nahal cave just below the ancient cemetery. 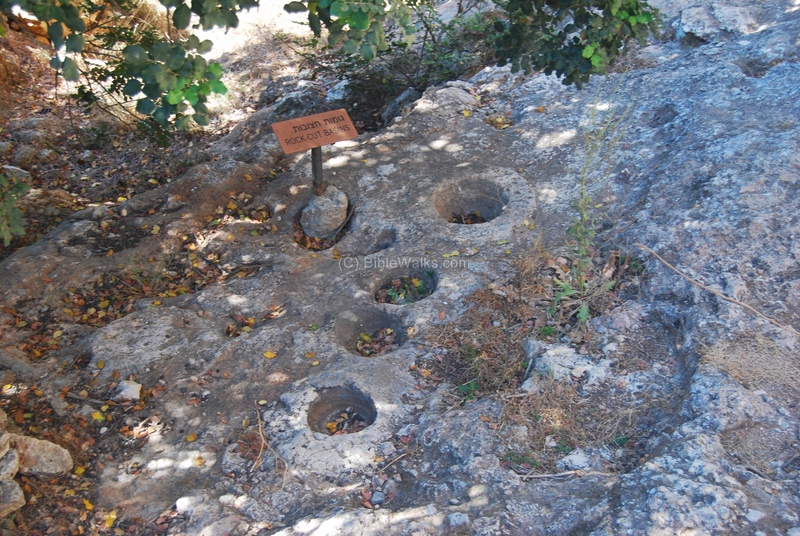 The display shows how they used these makeshift housings for hunting and fruit gathering, and important step for civilization of mankind on its way out from the caves. 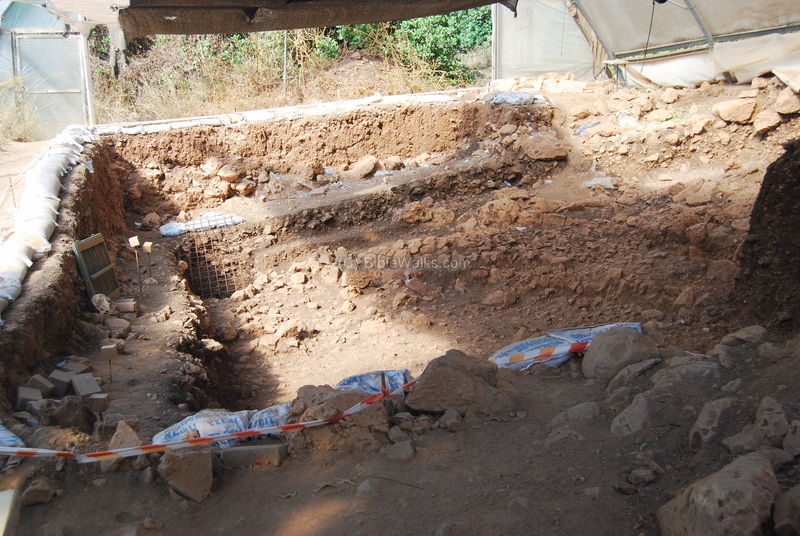 On a lower level than the Natufian cemetery is a section where archaeologists are working on a new dig. There are other caves in the area. The nature reserve stretches for 2KM on both sides of the Caves creek. A cave that looks like a "skull" is located across the valley, on the north side of the caves creek, and a group of hikers are seen walking up the cliff. Credit note: Thanks to G.M. of LMLK.com who provided corrections and suggestions. In the photo below: photo of a "caveman" - Uncle Amnon.